The Western Algarve, Europe’s most south westerly point, is a stunning region of pristine golden beaches, dramatic coastlines and beautiful, tranquil inland scenery. We are based in Praia da Rocha in Portimão a city steeped in history that, from early on, was a gateway to the Mediterranean and remains to this day one of the Algarve’s most attractive and historic towns. 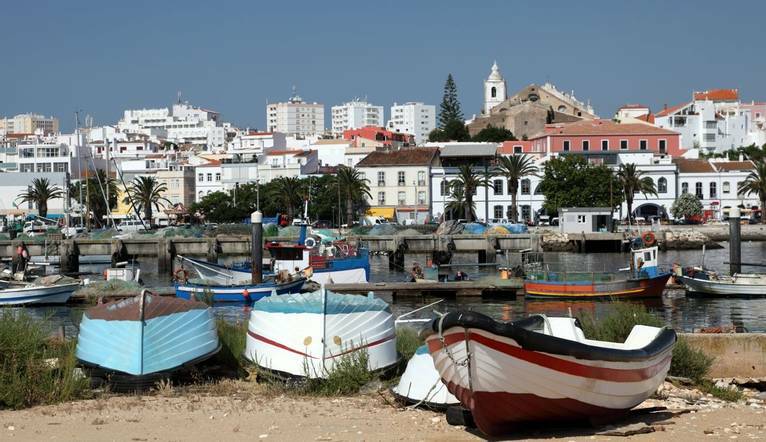 Lying along the bank of the Arade river, Portimão has a beautiful setting, with its wonderful marina, and tree-lined plazas, cobbled streets and picturesque squares and churches. This beautiful coastal walk takes us past the superb sandy beaches and dramatic headlands between Alvor and Portimão, including the much photographed beach at Praia da Rocha, one of the most beautiful in the Algarve. The rock strata here are particularly varied and very colorful, from white limestone to red sandstone. These different rocks support a wide variety of flora and, in spring, there are impressive displays of wild flowers. Today we take a fantastic coastal walk from Porto de Mós to Burgau with a lunch stop at Luz. This beautiful walking route traces the Algarve coastline from Porto de Mós to Burgau, with stunning cliff-top views stretching for miles around. The walk starts along a levada beside the Rio Arade and continues through the orange and lemon groves which are a feature of the landscape here. We finish in the charming town of Silves, where we have free time to explore this historic town. This inland walk takes in the villages of Barão de São João and Barão de São Miguel, charming rural villages, characterized by the region’s typical white houses with a coloured band around the windows and doors. This and the traditional Algarve chimneys demonstrate the many years of Moorish occupancy of the area. Excellent holiday. Great Tour Leader and local walking guide. Lovely walks, good company and great meals out in local restaurants. Excellent service from Solos holidays. Located in Praia da Rocha and just a stone’s throw from the beach, marina, restaurants and bars is our 4-star hotel. Facilities include a buffet and a la carte restaurant, bar, a very well equipped spa, including hydrotherapy units, fitness centre, massages and treatments are also available for an extra cost. Room facilities include, LCD TV, hair dryer, mini bar, iron and ironing board (on request) and 24 hour room service. Free Wi-Fi is available throughout the hotel. The transfer time from Faro Airport to the Jupiter Algarve Hotel is approximately 60 minutes depending on traffic conditions. Five guided walks are included in the programme. Your walking guide will advise you in resort of the daily programme. The walking programme is graded as Easy to Medium and you can expect to walk between 8 to 13km per day, with some ascents/descents, rough underfoot terrain and high altitudes involved. Good, high factor sunscreen, sunhat and sunglasses.